George Wythe began his teaching career in the traditional 18th century manner of instructing apprentices to his legal practice. His earliest known apprentice was Thomas Jefferson from 1762-1765. Subsequent Wythe apprentices included James Madison (future president of William & Mary) and St. George Tucker (Wythe’s successor as professor of law and police). In 1779, William & Mary’s Board of Visitors reorganized the college and created the chair of Professor of Law and Police – the first of its kind in America and the second in the English-speaking world. 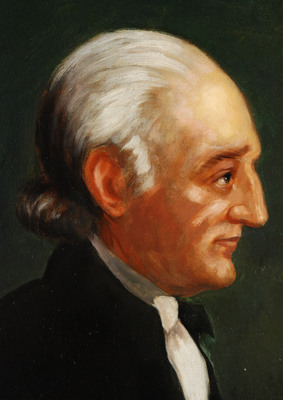 The Board appointed George Wythe as William & Mary’s first law professor, making him the first law professor in the country. Wythe lectured twice a week and assigned readings from major legal treatises such as Blackstone’s Commentaries and Bacon’s New Abridgment of the Law. He also introduced the use of mock trials and mock legislatures to American legal education in an effort to prepare his students for roles as “citizen lawyers”. Wythe’s students included John Marshall and Bushrod Washington as well as three future Virginia Supreme Court Justices and numerous future Congressmen and Senators. Wythe resigned his position in 1789, when the Virginia High Court of Chancery, on which he had served since its inception in 1778, relocated to Richmond. He moved with his court and continued his judicial career until his death in 1806. Check out Wythepedia: The George Wythe Encyclopedia for additional information about George Wythe. You can also listen to The Murder of George Wythe, a fictional account of George Wythe's death.